A great way to play! A quote from Plan Toys. "For more than 30 years, PlanToys® has been consistently developing its products and activities with a strong commitment that a company could ever made to contribute positively to the world. 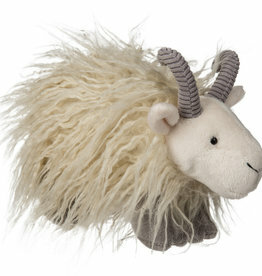 PlanToys® has grown from Green to Sustainability, roots through Sustainable Play. Sustainable Play is the foundation of how our toys cultivate creative minds and bring children closer to nature. Our children will grow up with knowledge and appreciation to respect and to preserve natural resources for the future generation knowing that they can make the world a better place. 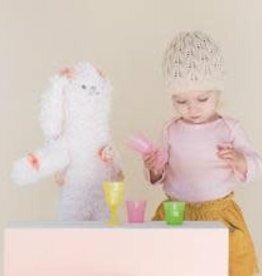 PlanToys® has gained recognition globally and branched out its philosophy with natural aesthetic quality through wooden toys. Our partners are in America, Europe, Asia and Australia." 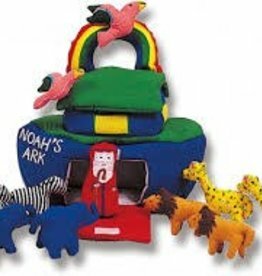 Cotton Ark in colorful fabrics with detailed animals that live in the ark.